Trailhead: The Loop Trail parking lot is located just past the Brook Trail Parking Lot in Weld, ME. Go off Byron Road for 5.7 miles and you will reach the Loop Trail Parking Lot. Click here for Google Map directions for the Loop Trail Parking Lot. Tumbledown Mountain is located in Western Maine near the town of Weld. 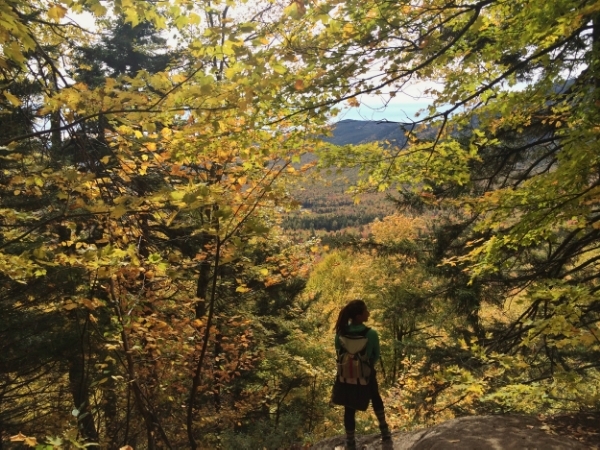 Western Maine is quite a -hike- for those of us that live in Boston, but during fall foliage season, it is one of the best places to spend your weekend. The foliage was just turning when we went. Lots of greens and yellows with a few reds. The weather was perfect hiking weather in the mid-50s. The Loop Trail starts a little less than 2 miles after the Brook Trail Parking Lot. The hike starts off with a gradual ascent for the first ~0.5 miles until you start heading up the mountain. There is some scrambling for the next 0.5 miles until you reach an opening where you can see the top of Tumbledown. From there, you will scramble up steep, slippery rocks until you reach the chimney. We had to help Tucker near the top of the scramble and also through the chimney. The book length says 1.5 miles for the Loop Trail, but I believe it was closer to 2 miles. To get through the chimney, you enter a small crack between rocks until you see three metal rungs. When you step on the first rung, you may need to take off your pack and throw it to the other side so you can squeeze throw the chimney. Once I got through the chimney, Loc Tite lifted Tucker from the bottom rung while I pulled him up using his harness. He was a great sport and pranced around all excited when he got up. This hike is dog friendly - with caution. From the chimney to the summit of Tumbledown is a few hundred feet or so. The summit is quite wide and good for lunch if you can find a spot away from the wind. Traversing across the summit is about 0.7 miles. You will then reach a sign and blue markers (see my photos) that point you to the direction of Brook Trail. This is where you want to go if you would like to do a loop. There is not much to say about Brook Trail except that it is gentler than Loop Trail but a lot less exciting. There are a few switchbacks and one small stream crossing, but most of it is a mild jaunt through the woods. From the end of Brook Trail to the Loop Trail Parking lot, it is about 1 miles according to the website. However, it took me 40 minutes to walk there, so I think it’s a little closer to 2 miles. The chimney is really what makes Tumbledown. I can’t say it enough that you should definitely try the Loop Trail if you’re coming here. Be careful and enjoy the views, readers!